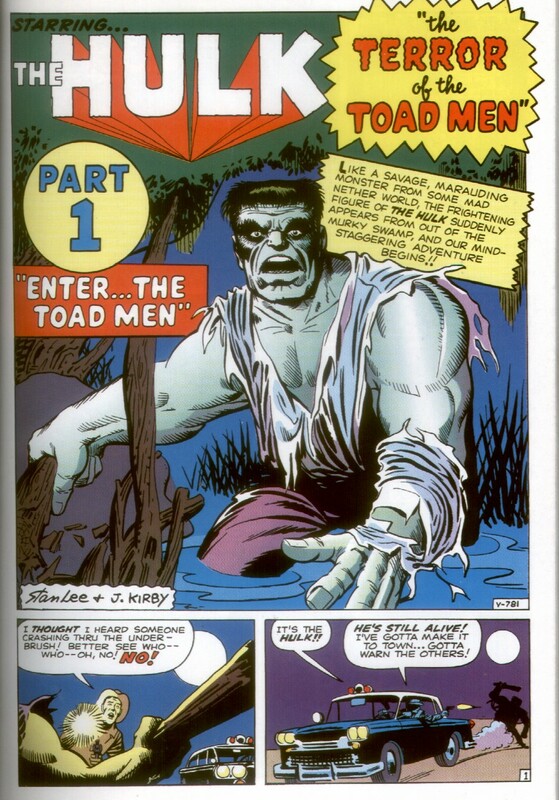 Our story begins with a thin (by Hulk-standards) looking gray Hulk emerging from the swamps. Plastered largely on the page is “the TERROR OF THE TOAD MEN” and “ENTER THE TOAD MEN”. 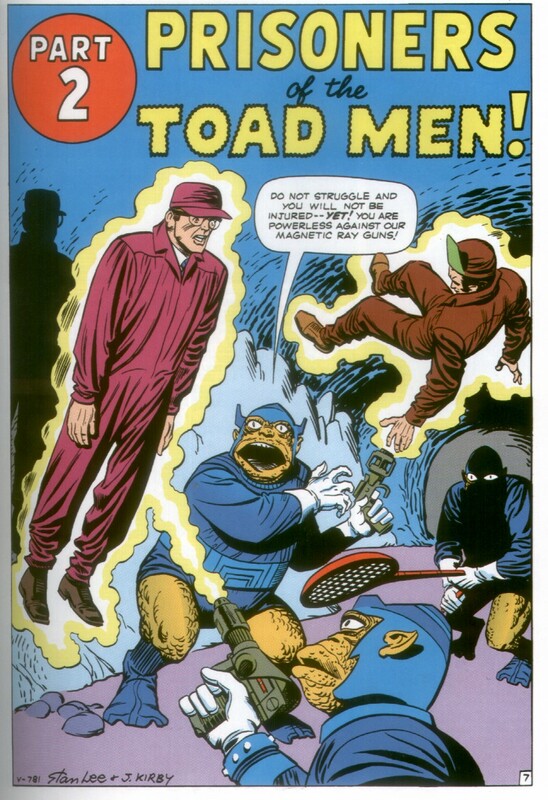 The cover said, “The terror of…THE TOAD MEN!” Okay already! Bring on the freaking TOAD MEN!! The Hulk is a serious freak of nature, and by this point EVERYONE seems to be chasing him down like he’s Frankenstein incarnate. Rick Jones (his teenage friend), saves him once again, reintroducing readers to how they met through a brief flashback. Meanwhile, aliens emerge from space and use a highly advanced beam which can locate the most brilliant scientific mind on Earth, that of Doctor Bruce Banner (the human form of The Hulk!). Armed with a very technical tennis racket, dubbed a “Magnetic Mind-Detector”, the aliens seek Bruce out in order to capture him and exploit his knowledge. Bruce takes Rick into an underground cave, showing him a unique concrete prison that he has built. I found this part of the story highly interesting, as it depicted Bruce as a man SO desperate to contain his second persona that he was willing to spend every night in this prison for the rest of his life (if need be). 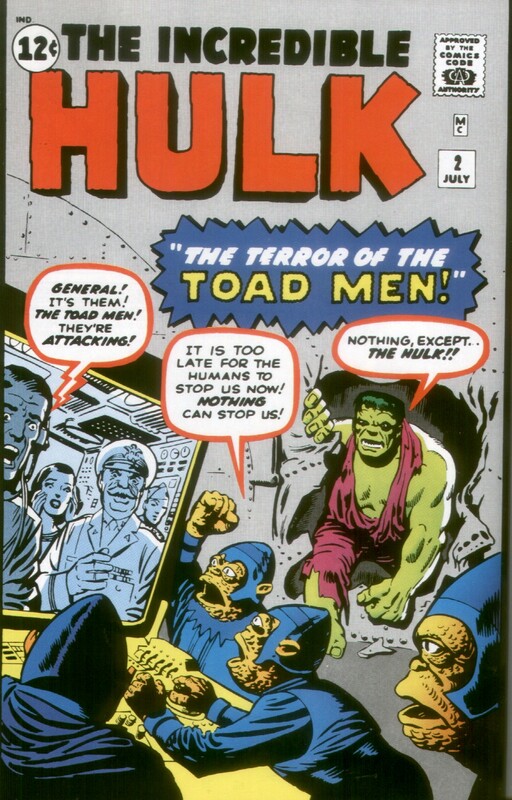 After Bruce shows off this elaborate Hulk prison, him and Rick are captured by the “TOAD MEN OF OUTER SPACE!” What’s even weirder is that this is a name that the aliens have given themselves… I mean, they actually say, “We are the Toad Men from Outer Space!” Cheese. They explain their power of magnetism, and the ability to glue people helplessly to the ground, as well as being able to extract the ocean from the earth. Sadly, the aliens screw up…BIG TIME!! They have Bruce on board their ship, and their ship continues to float around Earth’s orbit, eventually making it onto the dark side of the earth. OOPS! So then Bruce transforms, wrecks havoc as the Hulk, and the now unpiloted ship is hit by American defense missiles. The alien craft then crashes down to Earth. Another VERY STRANGE thing about these stories is that whenever there’s a ship in space that crashes, or gets shot down, it ALWAYS ends up crashing down into U.S. soil. Another way to propagandize making America the center of the world during the Cold War. U.S. Forces storm the ship, only to find Bruce Banner. 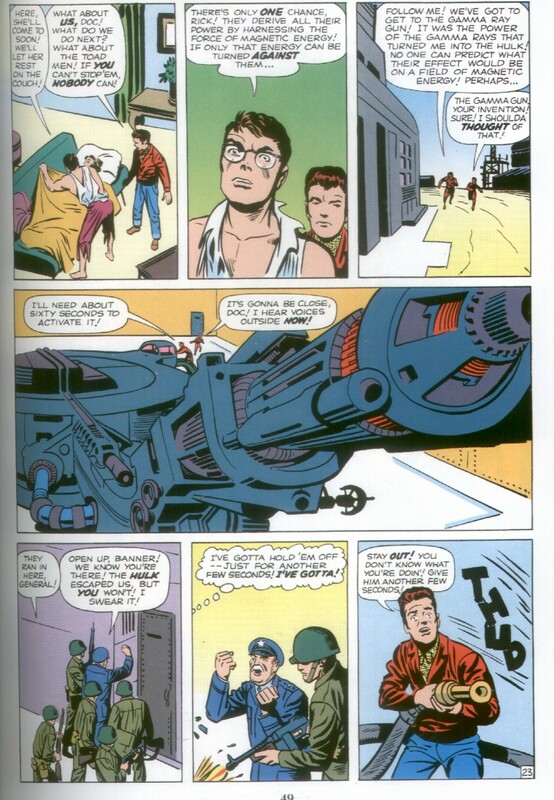 Bruce and Rick get thrown in jail, and General Ross accuses Banner of conspiring with aliens and abetting with Commies. With the attention elsewhere, the surviving aliens escape underground by digging a tunnel below their ship. The Toad Men signal an invasion fleet and use their massive magnetic powers to make the moon move closer towards the earth. This creates all kinds of problems as Earth’s poles begin to shift. Nighttime brings back the Hulk, who escapes from prison by “smashing through the steel bars as if they were CARDBOARD” (again), and causes him to hunt down the General. He could have chosen to hunt down more aliens, but says that “HE is my enemy.” OK. The Hulk eventually finds the General’s daughter, the woman he is secretly in love with. The classic “damsel in distress held captive by a monstrous beast” scene ensues, and he escapes her house with her body slung underneath his arms. How does he escape? He “lifts the side of the wooden building as though it is a paper box”. Well…at least they chose not to say ‘cardboard’ again, but it’s pretty much the same thing, right? This story has another one of those “Marvel endings” though, and it left me with a bad taste in my mouth. By “Marvel ending”, I mean that they are always able to resolve the most RIDICULOUS and INSANE scenarios in the last two pages of the comic. Here we have TWO pages left, and the Hulk has just transformed back into Bruce as daylight breaks. The moon is now so close to Earth that it is causing violent earthquakes, and there’s chaos everywhere! Also, the United States Army is hot on his heels. WHAT THE HELL IS HE GOING TO DO TO SOLVE THIS IN TWO PAGES?! Quick! It’s your chance. What would YOU do if you were Bruce Banner? I’ll give you a minute to imagine the possibilities. Ok. Ready to see how the REAL thing unfolded? Read on, true believers! Isn’t it sad that the last line sounds as though Rick is getting a little bit of pleasure and excitement out of Bruce’s unfortunate curse? He really CAN’T WAIT until their next adventure? BRUCE IS A TORTURED MAN, and Rick can’t help but get off on the fact that he’s met this guy who makes life a little more thrilling? Well, thank GOD that Bruce saved Rick from getting hit by the gamma blast. If Rick were the Hulk, mankind would be screwed. So, this second issue was very much like the “aliens invade and we have to fight them off” second issue of Fantastic Four. 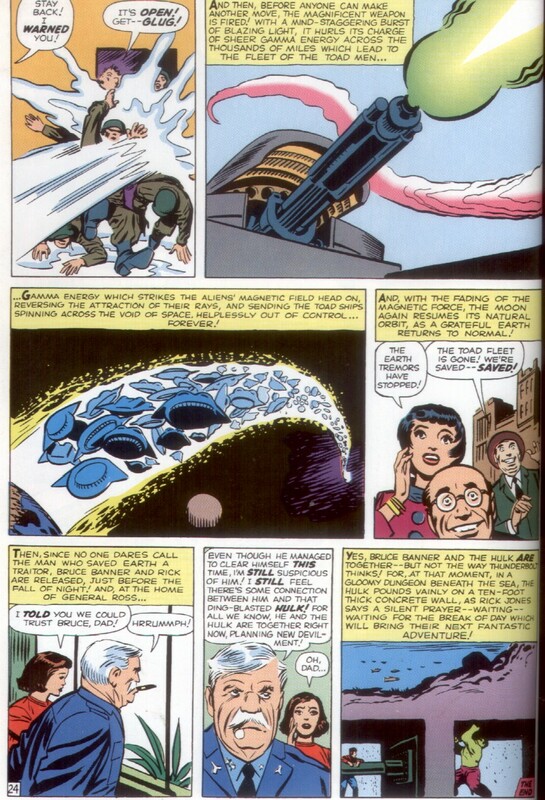 We’re BARELY into the early years of classic Marvel and already are they rehashing the same ideas (aliens, damsels in distress, rockets, mutant scientists, gamma rays, Communists, CARDBOARD!). I’m REALLY hoping for something new to happen soon. I’ll keep you updated!